“Sol Latino” offers you the opportunity to experience the Guatemalan warmth and hospitality by living with local Guatemalan families during your studies. 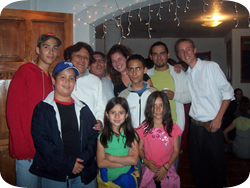 The families we work with have many years of experience hosting foreign Spanish school students in Quetzaltenango. Our families have been carefully selected and are capable of hosting students with a variety of needs, they are very friendly, diverse (with or without children, pets, Guatemalan University students, etc…), and will prepare healthy and hearty meals for their students. Often these families will invite their students to spend time with their extended families during holidays and other special occasions to give the student a unique view into the culture. Living with a host family is immensely important to truly immersing yourself in the Latin culture and to practicing the Spanish language. For the best possible immersion experience we highly recommend that our students stay with host families. Something that you should be aware of is that when you live with a Guatemalan family, there will be differences to your own home and culture; especially the way in which you live, your food and living environment. However, we encourage you to approach this positively as a way to learn more about a new culture and customs. The Guatemalan diet is basic and you will eat the same food as your family. In Guatemala the main meal is lunch; generally families eat black beans, tortillas, rice, potatoes, eggs and chicken. If you are a vegetarian, vegan or have allergies or special dietary restrictions, please let us know, it is not a problem: we will choose the best family to meet your dietary needs. What is included in your homestay? All of our families live close to the historic center of Quetzaltenango and to the school so you can easily walk to your classes within 3-10 minutes! In addition, as our families are located close to the school it is easier to meet and go out with your fellow students for various activities. “Sol Latino” recommends that you stay with a Guatemalan host family while you are studying Spanish in order to experience complete immersion.